Continuing what has become an annual tradition, the Choirs of St. Pancras under the direction of Steven Frank, Director of Music and Organist as well as president of the Virgil Fox Society, presented their Christmas concert by singing from the front of the church around the altar. 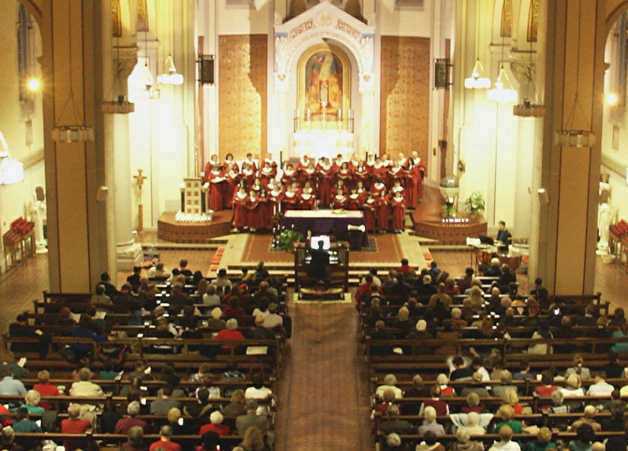 Usually the choir sings from the choir loft, where the three-manual Allen organ console is located. Playing a two-manual 53-stop Allen Renaissance organ which had been temporarily installed for the annual Christmas concert, Mr. Frank conducted, accompanied the choir, played organ solos, and spoke to the audience, immensely entertaining the packed audience. Mr. Frank said later, "I was so impressed with this organ that I decided to make a recording on it. Although not a large instrument, it was able to handle everything I could throw at it, including the Liszt Fantasie and Fugue on 'Ad Nos Ad Salutarem Undam,' which is one of the largest works in the organ repertoire." The recording, "Images," will be released shortly. Pictured here (at left) is the St. Pancras Choir, with Steven Frank, organist and conductor, and Keith Crupi (right), tympani.